Choosing the right fittings and tubing is almost equally important as choosing any other component in a liquid cooling loop and usually very confusing to beginners. First, you must know what to choose, because there are several types of fittings and tubing and this subject is quite broad. Nevertheless, we will try to cover all of the important information. It is crucial that you match the fittings dimensions with the tubing dimensions and this requires some planning ahead. 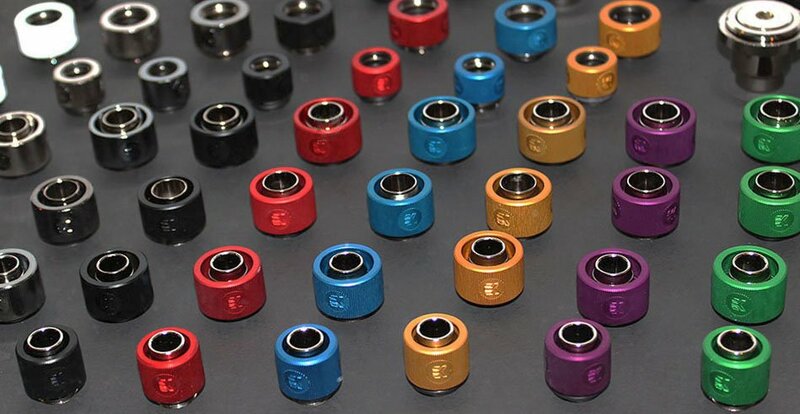 Usually, users first choose the fittings and then pick the matching tubing, or vice versa – they chose the tubing first and the fittings. We always recommend you plan the tubing first. We separate tubing type into two main branches. Soft tubing and hard tubing. These two types of tubes use entirely different fittings, and we will go over the basics of the tubing, because it will be easier for the reader to distinguish the types of fittings later on. Soft tubing is often made out of norprene, rubber, silicone, PVC or other special compounds. You can choose see-through – clear tubing, colored – non transparent tubing and UV reactive tubing. You cannot choose any tubing from the local market for water cooling. Tubing for water cooling is specially made to withstand long periods of time without any discoloration, deformation or degradation. If aesthethics is one of your main goals with liquid cooling, and you plan to use colored coolants, make sure that you choose a quality tubing that will stay crystal clear as long as it can. Low grade cheap tubing can lose its transparency in a matter of days and it often becomes yellow. Liquid cooling tubes need to be soft enough to allow tight bends inside of the computer case and hard enough to withstand collapsing – kinking. Special Anti-Kink coils are available for purchase and these are actually „springs“ that prevent the tube from collapsing. Moving onto the other type of tubing, called hard tubing. Unlike the soft tubing, that is made of some sort of synthetic rubber or plastic, hard tubes can be made from a broad spectrum of materials. The most common hard tubes for liquid cooling are acrylic (plexiglass) or PETG (polyethylene terephthalate). They are cheap, easy to come by and can be shaped and bent in every household. There are tools available which can make acrylic and PETG bending really easy, but we will not elaborate on that subject now, we will leave that for another article as hard tube bending is more advanced. The other, less common hard tubes can be made out of copper, brass, borosilicate glass and nowadays even carbon tubes are coming into fashion. The potential problem with these materials is that bending them is not possible or bending requires special tools. We say the „potential problem“ because skilled and more advanced users actually prefer these luxurious materials because the loop can still be connected just by using more adapter fittings and more joints. Hard tubing can offer a few things soft one can never do, and that’s the luxury and exclusivity we have just mentioned. Hard tubes offer clean and well organized look. Brass and copper tubes can be nickel plated to achieve more sophisticated and aesthetically pleasing look but are not recommended for your first custom loop. We recommend soft tubing for beginners! 2. How to read tube measurements? Metric and imperial measurements of the fittings provide inner and outer diameter. If you decided to use soft tubing in the first step, then you can use two types of fittings, barbed fittings or compression fittings. On the other hand, if you decided to use hard tubing in the first step, then you can use push-in fittings or compression fittings. Soft tubing can use two types of fittings, barbed fittings and compression fittings. Barbed fittings are simple, not very expensive, very easy to use and have only one number to mark them. The one number marks the ID (Inner Diameter) of the tubing that will be compatible with the fitting itself. Meaning, there are three main types of barbed fittings: 10mm (3/8”), 12mm (7/16”) and 13mm (1/2”). It is not necessary, but it is rather recommended to use some type of tightening system to secure the tube on the barb fitting. Again, several types of clamps are available. You can use plastic clamps, metal clamps or even just ordinary cable zip ties. While barbed fittings are easy to use and are cheap, they are often aesthetically challenged. In more direct words, a bit ugly. But it doesn’t matter, that’s why compression fittings are there! Same as with the barb fittings, compression fittings can also support various tubes. Unlike the simple barbed ones, compression fittings are marked with two numbers, and both the ID and OD markings of the tubes must match the fitting. Thankfully, both the tubing and fitting types is standardized, so you are left to choose from the earlier mentioned 10/13, 10/16, 12/16 and 13/19 sizes. 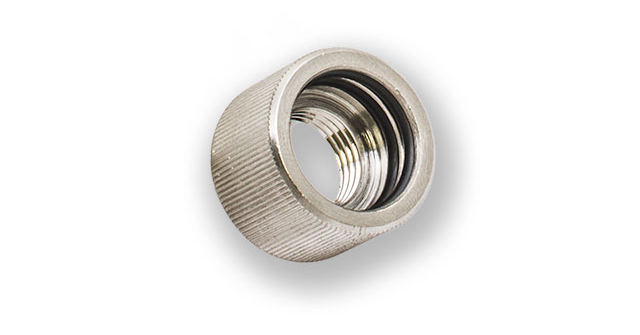 A compression fitting consists of two parts: the main part is the base and it’s very similar to the barbed fitting, but it has a thread at the bottom. The other part is the locking ring that prevents the tubing from slipping off the barb. There is a point where the locking ring compresses and grips the tube, making an airtight seal, hence the name „compression fitting“. Unlike the barbed fitting, where the tube just goes over it, much of the compression fitting is exposed, leaving a lot of room for manufacturers to play with the aesthetics. The locking ring can be formed and painted in many exciting ways and that is why builders are favoring them for their water cooling systems. Compression fittings are more expensive and require a bit more access, because the user must tighten the locking ring to ensure a leak free connection. A simple fitting tightening can be a time consuming process, especially if mATX or mITX cases are used and you just can’t get a good grip on the locking ring. For reasons like this, it is recommended to combine quality and compatibility tested tubing and fittings, because even a few microns of misalignment in the thickness of the tubing can make the tightening of the locking ring hard or even impossible. Fittings for hard tubes come in two sizes and two types. Most common sizes are 12mm and 16mm tubes. Hard tube fittings feature only one number for labeling, which is for the OD (Outer Diameter) of the tube it can accommodate. Fittings for hard tubing can be simple push-in (HD fitting) type. The HD fitting has two o-rings on the inside – you just have to push the tube into the fitting and airtight seal is made. Same as for the soft tubing and other water cooling components, you cannot pick up just any random hard tubes from the flea market. The tubes you use must exactly match 12 or 16mm outer diameter (or the diameter set by the fitting you bought), because if leaks can occur, your components may be harmed. Always pick parts from well known manufacturers to avoid unpleasant experiences with water cooling. We said that one type of fitting used for hard tubing is the HD – plug in type, and the other one is called HDC – Compression fittings. 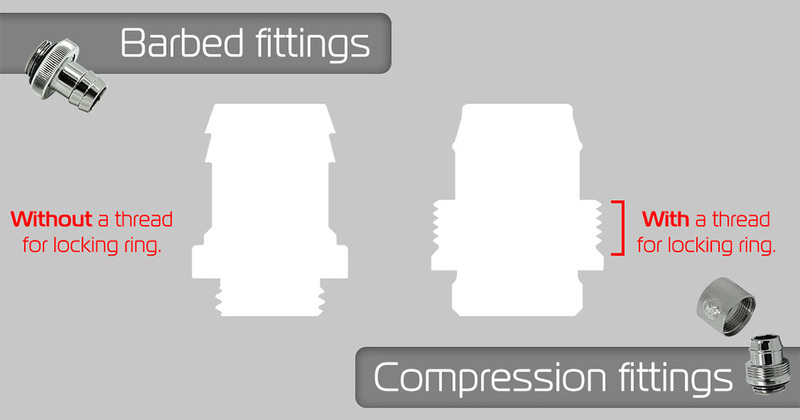 The HDC fitting, much like the ordinary compression fitting, consists out of two parts: the base, and the top locking ring. The story is exactly the same with compression fittings and compression fittings for hard tubing. They are safer and better looking too. The HDC fitting has two o-rings – one in the base and one at the top that is being compressed against the tubing when the locking ring is being tightened. Regarding the fittings, there is one more detail you need to know. 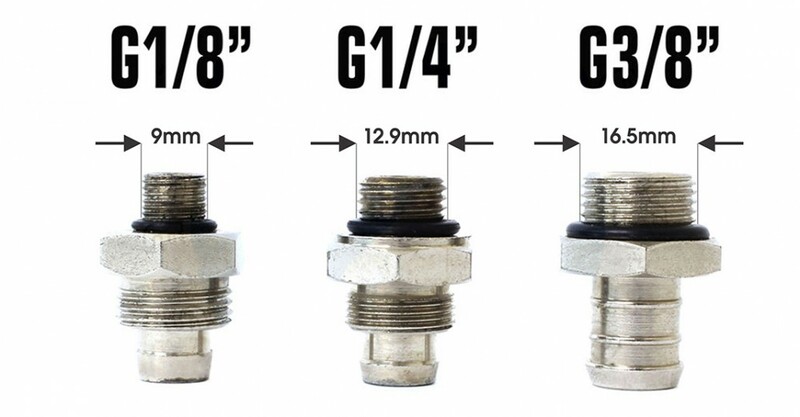 Almost all of the fittings nowadays use the G1/4“ thread (12.9mm wide), in case you are tumbling trough some older water cooling gear with G1/8“ (9mm wide) or G3/8“ (16.5mm wide) threads. But like we said, the G1/4“ is the most common and the other sizes have become very rare. So G1/4″ label is just the thread size label. We are saving, probably the most important part, for the end. It is very important to know that choosing thicker tubes and bigger fittings will not result in greater flow. As we said, the great majority of the fittings and connections on water cooling parts use the G1/4“ thread. The cross section of the flow is limited by the outer dimension of the fitting, and the inner diameter of the fitting with a G1/4“ thread usually cannot exceed 9-10mm. Meaning, even if you choose thicker tubes, at the end of the tube the fitting will narrow the flow diameter down to 9-10mm. Water blocks and other parts can be restrictive also, so by using the thicker tube, before and after the water block, you will have no benefits in flow rate. If a greater flow rate is required, a more powerful pump is to be chosen. We would wrap up this article at this moment, although we are certain that we forgot to mention something. As we said at the start, this subject is very broad, there are many choices, but we hope that we managed to cover the basics. In one of the future articles we will cover the subject of angled adapters and other special connectors, such as T-Splitters and Ball Valves! We would most certainly like to invite you to comment on this article, whether you see it on the EK blog page or on EK Water Blocks Facebook page. Feel free to fill us in if you feel that we left out some details. I would very much like to read the angled adapters guide and the special connectors guide as I am trying to find a drainage valve online and I can’t seem to. I’m new to water cooling so any guide I can find, I will read. Including reddit. Great guide, thank you for creating it. Its easy just use a ball valve with a barb fittings on a soft tube. Connect the ball valve to the outlet of a pump and whenever you want to drain the loop just turn the valve and your loop is empty !!!!! I am using 12mm ID barbed fittings. Does that mean the tubing I want is 12/16mm soft tubing. In the past I use to just get some stuff from the local hardware store and just took a fitting with me to see what tubing fit over the barbs. This time I want to do it correctly. P.S I think that I should go with compression fittings. Hey man, i was just like you trying to search everywhere to find the right tubing but it all comes down to simple knowledge of the diameter of the tube that you are using. Since you are going with hard tubing it is recommended to use the better compression fittings as they offer a tight leakproof fit(Doesn’t mean your loop won’t leak). First try to plan out your loop using your imagination and this is where you can get creative, try different bends to see which loop suits your pc the best, if you find it difficult to imagine try drawing it with the specific measurements to stay as accurate as possible. Secondly, don’t try to buy all the fittings at once as every loop won’t turn out perfect at the first try. If you have plotted out your loop properly then try seeing where you need more fittings. Third and most importantly one cannot guess the exact fittings one needs as it all comes down to practicality. Try buying 3-4(Or more if necessary)fittings at first if you are cooling only the cpu and 7-8(Or more if necessary) if you are cooling the cpu and gpu and it is the same thing for the motherboard waterblock too. Once try putting your fittings together and then you can make out the exact number of fittings required. Hope I was of good help and dosend a pic of your pc once its done !!! Sirs, EKWB, I’m about to purchase a Predator 240 AIO Water cooling system. I’m using a Obsidian 750D Case, with a LGA 1150 MBoard. I was thinking of replacing the standard Soft Tubing and Compression Fittings with AN Fitting’s and PTFE Conductive, and non-conductive Hose’s. They say the hoses are not for Steam – cold water cycling. But adding Mineral water and Coolant Premixes would these hoses work. This site is filled with great knowledge. Thank you….